Here is the first page of the Babylonian Talmud, as it appears in the standard Vilna edition. The standardized pagination folows that of the third Bomberg edition, Venice, 1548. Pages are numbered by folio. This page is Berakhoth 2a (that is, the first side of folio 2 in the tractate Berakhoth, "Blessings"). Considered from the standpoint of typography alone, the printed page of the Talmud is an amazingly complex text with many intertextual connections representing fifteen centuries of discussion. Let's color-code the layout so that we can distinguish the various layers more easily. The text of the Talmud itself is in the middle, written in square Hebrew letters. This text is surrounded by commentaries and marginal notes. Rashi (Rabbi Solomon bar Isaac) is the most important commentary and he is always found on the side of the page closest to the binding. The Tosafists are found just on the other side of the Talmud. The Tosaphists provided a "super-commentary," a commentary on Rashi's commentary. The first Tosafists were Rashi's sons-in-law and grandsons. Rashi and the Tosafists appear in a special, round "Rashi" script. 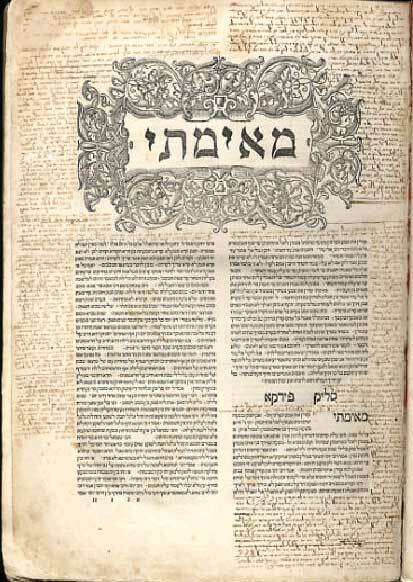 Here is the first page of the first printed edition of the Jerusalem Talmud, printed 1523 in Venice, by Jacob M. Lowy (Collection, National Library of Canada).